Our context adds content to our worship of God. In other words, what we see, smell, hear, feel, and think add depth and texture to our worship of God. Where we are when we worship God matters. Of course, you may want to argue this point with me. As Jesus rightly said in John 4:23, “But the hour is coming, and is now here, when the true worshipers will worship the Father in spirit and in truth.” This statement was made by Christ in response to a question about where someone should worship (in Jerusalem or in Samaria.) Jesus’s answer takes worship beyond a building to a connection of our hearts to the heart of God. Because of Jesus answer, traditions like mine have rightly emphasized truth (the teaching of God’s Word) and the non-physical in worship. While there is much good that has come from this reformation inspired thought, in our focus on teaching and the non-physical, we sometimes miss the opportunity to worship God fully by only engaging the right side of our brains. Sight – Seeing the ethnic diversity of the congregation gathered together in worship was a powerful reminder of the unity that is found in the Body of Christ. On the outside, all too often we all go to our “own” churches. On the inside, only one church exists, and it forces men from different backgrounds, ages, worship styles, theological backgrounds, races, and languages to worship together in the same room. This alone was a powerful sermon on the power of Christ. I spoke on Ephesians 2 and the unity that Christ has bought for us my second night there. My message paled in comparison to the testimony of those present in the room. In our world too often the options we have prevent us from living within a context that inspires worship simply by the sight of it. Sound – At several moments during our time of worship, the men would simply break into applause, celebrating the work of our God in a very culturally relevant way. The sound of these cheers lifted my heart and reminded me of the reality of the words we were singing. Too often worship can become like watching a game on television . . . we feel like we are all alone and that we are not needed, so we sit silently watching the action on the screen. In reality, worship is like being at the game . . . we join the voices and cheers of others because we are on the same team, and our voice absolutely needs to be heard. Smell – I have been to this prison many times, and I am always reminded of this place by its smell. I do not mean that it smells bad. It doesn’t. It’s just that the entire prison is probably cleaned by the same industrial cleaner, and so every room has a similar scent. This smell (for me) was a constant reminder of where I was. This was not a bad thing. The contrast of freedom in Christ behind physical bars was powerful fuel to my worship. Singing, “Freedom reigns in this place. Showers of mercy and grace. Falling on every face. There is freedom!” while smelling prison brought me to tears on a couple of occasions. 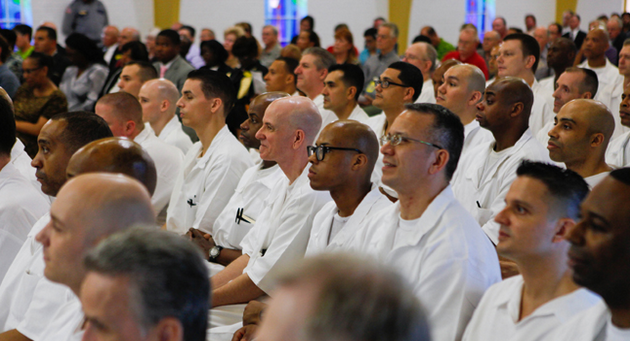 Feel – On my last night in the prison, the men brought me up on stage after the service, laid hands on me, and prayed. I can still feel the weight of their hands on my shoulders as they all (some 150 men) prayed simultaneously out loud for God’s provision and protection for me and my family. It was totally overwhelming. Feeling the touch of their hands on my shoulders powerfully drove home the fact that they were lifting me up. A refuge for the poor, a shelter from the storm: this is our God. He will wipe away your tears and return your wasted years: this is our God. A father to the orphan, a healer to the broken: this is our God. He brings peace to our madness and comfort in our sadness: this is our God. Knowing the background that many of these men had come from (the broken homes, poverty, abuse, etc.) and knowing the fact that these men at some level felt as though their years were being wasted, the lyrics took on powerful depth and texture. I was able to appreciate our God even more in this context. Now, I want to make something clear. I love the worship at my church. Greg Hill is one of the finest worship pastors and men that I have ever known. The team he leads does a wonderful job of leading us in worship each week. The problems I was having in worship had nothing to do with someone else . . . they had to do with me. I needed to change my setting to remind myself of the importance of context in worship. The past couple of weeks, I have loved worshipping God with a renewed sense of interest in what I was seeing, hearing, feeling, smelling, and thinking.